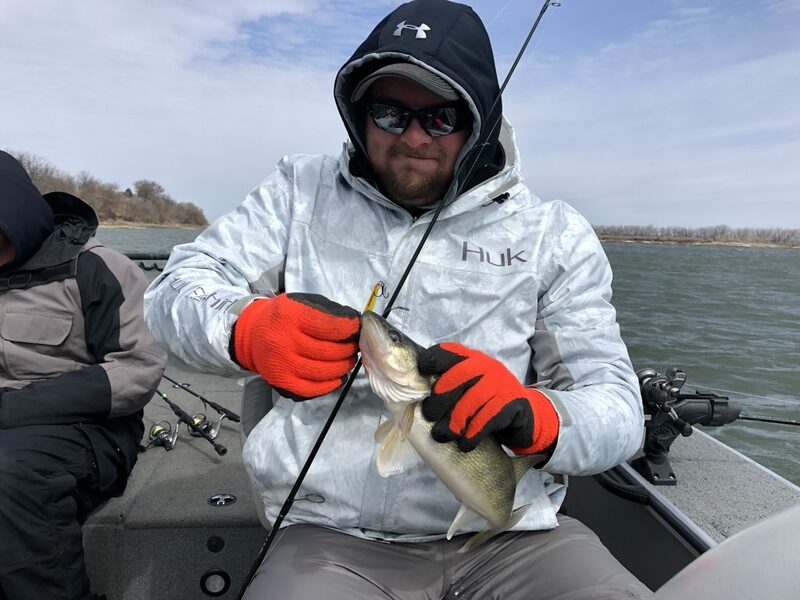 I promised after I was done guiding this weekend, I would give you a fishing report from the Missouri River System near Bismarck. With our recent snowstorm we had on Friday, we saw our water temps drop significantly. Our weather Saturday was really nice! Probably our nicest day overall we have had all spring. In order to avoid a lot of the congestion in town I decided to Guide south of Bismarck in the dirtier water. We are still seeing mud coming out of the Heart, Apple and Cannonball Rivers. The one thing I really noticed down south is the lack of current. The water isn’t moving very fast down south therefore I feel it is taking longer for the mud/dirty water to flush out. We did however find some fish. Even in the darker water where you could probably see 6 inches roughly. We didn’t catch a lot of fish down below Bismarck but we did however find quality. We probed the sandbars with jigs and minnows and jigs and plastics. We also pulled some crankbaits. All those ways caught fish. The fish varied in depths, so I wouldn’t say that they are in any particular areas quite yet. Today with the heavy winds, I decided to stay closer to town. I fished north up towards double ditch and south closer to the Heart River. Trying to avoid boats and wind today made things trickier. We moved around looking for quiet water or I should say fishable water away from the heavy winds. Not an easy task, but we did find two spots that seemed to be better than the rest and we were able to catch plenty of fish. Again, it was a mix of presentations and depths. Everyday has been different and today was no exception. The nice part is there are fish around and done big girls also! I have Guide date scattered here in April and May for the River here near Bismarck/Mandan. Email me to reserve a day in the boat chasing these sand lizards!